"There aren’t that many women in construction but a lot of work is underway to get more trainees in. I think it’s changing gradually – I hope so, I think women have a natural eye for detail." School holidays helping her dad’s business helped fire teenager Maddie Kirkman’s dream of a career in construction. Maddie, 17, is on the second year of her Derby College Level 3 BTEC in Professional Construction and the Built Environment and an apprentice at GF Tomlinson in Little Eaton. She first got interested in building when she helped her dad – on site and in the office – at his mechanical and electrical company. 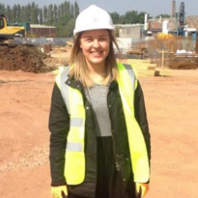 Maddie plans to use her BTEC as a stepping stone towards a foundation degree and full degree in quantity surveying.